(Non game news) Despite eating badly when I arrived (and then again in America), my health is under control, but I’m still planning on visiting some new doctors/nutritionists that came highly recommended. (Game news) I am working on an entry to Public Domain Jam! 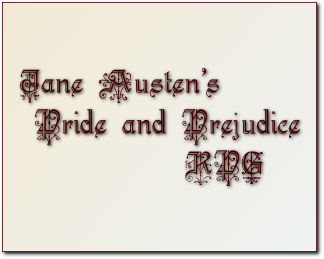 I am FINALLY realising my seven-year dream of a Pride and Prejudice RPG! (Research news) There have been some amazing articles coming out recently on the effect of games on PTSD. Some I disagree violently and furiously with, others make me incredibly excited and inspired. Look out for posts on those bottom two bulletpoints some time soon. And why do I mention bullet point 1? Because when I’m not well, I don’t have energy for Life Outside Work. So now I am, I do. I had a bit of an “Aha! Moment,” and this is probably obvious to a lot of people, but I’m going to write about it anyway, because its quite important to me and my growth as a designer. I’ve been thinking a lot recently about what makes the games, films and stories I’ve liked so memorable. For me (and I’m not saying this is the same for everyone), its usually the world, the characters. I don’t necessarily want to escape to there, but I enjoy visiting and spending time there. I used to re-read “The Great Gatsby” and stop before the end, because I didn’t want that world in its present form to die. I love Tragedy (if you haven’t guessed by now), but I love being in that world more. Then, I started thinking about what elements of games, in particular, made those worlds and characters memorable, rather than just being a setting for which some story/set of game mechanics takes place. And it is almost always those little moments of surprise and delight when you figure something out naturally, where you have a little success. It might not even be anything to do with the gameplay, but its a moment when it feels like that world both exists without you, and yet entirely for you. In “Seductive Interaction Design,” Stephen Anderson describes how the use of Easter Eggs can delight and emotionally bond the user. Well, I usually think of Easter Eggs as being something that breaks your immersion with a joke or side-reference, but I think I’ve been wrong about this, and that they work exactly the same way in games, bonding the user to the world and the characters. Brilliant video from Screen Australia/AFTRS. Michael Hauge discusses what a High-Concept movie is, and how to design/develop one in any genre. He discusses it very succinctly and honestly. Focused and useful! Since I’m getting more interested in UX design, I thought I’d start off my self-imposed learning curve with this. I used the $30 Dymocks voucher from work to order it, and it just arrived today. I’m looking forward to reading it and giving it a review! So yesterday I finally sat down and got a good start on Georgia and the Dragon. I’m using Adventure Game Studio (AGS), which is software designed specifically to make graphical/point-and-click/2D (call them what you want) adventure games. I had started playing around with it a year or so ago, and had managed to put together a brief demo of The Illusionist’s Fate (a deconstructed narrative I was developing through a ScreenWest Digital Development Breakout grant) using existing art (map and some scenes inc characters). For some reason, I couldn’t seem to manage to get myself to sit down and do work on GatD. Firstly, there was a whole stack of emotional/self-esteem/motivational issues that were getting in the way (which I might blog about later). But then, every time I opened up AGS, I couldn’t seem to find where to start. I followed my asset list and made all the Rooms, Characters, and Items, but beyond that I felt at a loss. Using the standin “Roger” player character animation that comes with AGS seemed to be the most glaringly annoying. I told my boyfriend, “I need to do the art first,” but he, a programmer, said that I just needed to “start coding.” Well, AGS is set up to be for “mid-level designers,” NOT programmers, and so a lot of the way it’s set up is that the behaviours are already there, you just need to put some art in, and then draw regions for hotspots and things. Everything is tied to rooms, regions, and characters. So basically, how am I meant to start if I don’t have anything to start WITH? I thought back to Illusionist’s Fate, and how easy it was to “start” with that. That was easy because firstly I had a design doc (which I also have for GatD), and a lot of concept art. So I knew I needed art, at least a character sprite and backgrounds. Anyone who has known me for a while knows that I’m pretty capable of art. The problem is, I also have very high standards for myself. And then, Photoshop’s billions of colours got in the way.. So I looked up some graphics programs recommended for use with AGS. I’ve downloaded Spriter to try, but am currently using Aseprite to do basic pixel-based sprite graphics. Because of the paint-style limitations, it became a lot easier to knock together a set of temporary backgrounds, which made it easier to start scripting movement between rooms. Yay!! You may have seen it on the front page of this site, but I now have a fancy-pants new logo. It’s only taken me like, forever to settle on something I like and don’t feel weird/ashamed of. So I hope you like it too, and if not… too bad.